Single sport specialization has become increasingly popular among many coaches and parents in the last 15 years. A collaborative project by the AOSSM finds that early sport specialization may put young athletes at risk for overuse injuries. 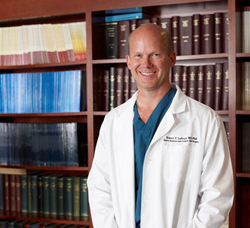 Complex Knee and Sports Medicine Specialist Robert LaPrade, MD, PhD. The problem of early sports specialization among young athletes in our country is becoming an epidemic. Robert LaPrade, MD, PhD, Colorado Knee Specialist and Chief Medical Officer at the Steadman Philippon Research Institute, participated in the study “ When Is It Too Early for Single Sport Specialization?” This was a collaborative project from the American Orthopaedic Society for Sports Medicine (AOSSM) Research Committee that was recently published in the American Journal of Sports Medicine. Although the data for this project was limited, there is evidence that early sport specialization may put young athletes at risk for overuse injuries. Further research is needed to determine other injury patterns in youth athletes and their long-term consequences. “The problem of early sports specialization among young athletes in our country is becoming an epidemic. In addition to increasing the injury rates among these young athletes and increasing our overall health care costs, it also appears to be limiting them in their overall skill levels. Almost all of the first round draft picks in the recent NFL draft were multisport athletes,” said Dr. LaPrade. Over the past 15 years, there has been an increase in youth sports participation along with an increase in early year-round training for a single sport. There is a perception among parents and coaches that early sport specialization gives youth athletes a competitive advantage for athletic scholarships and potential professional status. This study highlights the risk factors of early specialization in sports including ice hockey, swimming, gymnastics, and baseball. There is considerable controversy as to when, how and why a youth athlete should become a single sport athlete and it is challenging to determine the age and competitive level that defines early sport specialization. A study of high school athletic directors reported that there has been an increasing trend toward sports specialization at the high school level. There is also evidence of early sport specialization in year-round travel leagues for preadolescents and the increase in youth Olympic athletes. The shift from youth driven recreational physical activity to parent and coach driven specialization in the last 20 years has been due to the increased emphasis on sports accomplishment in society, financial rewards for elite athletes and public perception of the value of elite athletic competition. This trend has led to a growing concern in the sports medicine community that early single sport specialization may increase the rates of overuse injuries and psychological burnout in youth athletes; however, this relationship has yet to be clearly demonstrated with the available literature. The muscles, ligaments, and bones of adolescents are not fully developed, making them more susceptible to overuse injuries due to repetitive motions at an early age. Baseball pitchers have received the most attention related to early single sport specialization. Little League baseball is structured to begin at age 5. A repetitive, forceful overhead throw can quickly lead to overuse injury, specifically in the ulnar collateral ligament, which typically leads to “Tommy John” surgery. Some studies have suggested that late specialization in a particular sport - defined as older than 12 years of age - may result in better athletic achievement than early specialization. For example, a study of more than 1500 German Olympic athletes found that those who specialized later were likely to have participated in more than one sport after the age of 11. Among athletes in a variety of sports, the most elite group was more likely to have begun intense training after the age of 12 and to have played multiple sports during the developmental years of 11 and under. Fortunately, research on the risks of single sport specialization in youth athletes is increasing, which will lead to a greater understanding of the determinants of overuse injuries. It is essential that parents, coaches, trainers, and physicians become educated on the risks of early sport specialization and the early signs of injury. Both early specialization and injury could limit future athletic participation. Colorado knee specialist Robert LaPrade, MD, PhD is recognized worldwide for his treatment of complex knee injuries at The Steadman Clinic in Vail. Currently the Chief Medical Officer at the Steadman Philippon Research Institute, Dr. LaPrade is a prolific researcher and one of few physicians with over 200 peer-reviewed publications published in the field of orthopedic research.